His influence has risen above race and he has improved the lives of millions, including some of today's most influential and powerful people. In Bishop T.D. 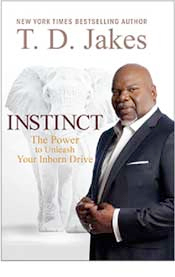 Jakes's latest bestselling book Instinct, he discusses how anyone can and should listen to their gut despite what data may say or which naysayers may surround them. I was privileged to connect with Jakes who gave some heart-to-heart advice of how use your instincts to rise above pain and struggle when you might be surrounded by it. How do you make the best decision when you're emotionally connected to how the outcome will be? I think you make the best decision because you're true to yourself, and when you do things that are organically true to yourself, it is the best decision for you, it is the best job for you, it is the best person for you. But that's more in line with what I'm talking about. How can someone who wants to do something, beyond what their friends or even their race normally does, succeed when naysayers are telling them to get back in the cage with them? I looked at all types of people who have done exceptional things, and they did so in the face of criticisms and oppositions. If we acquiesced to the status quo, we wouldn't have the airplane, we wouldn't have the steam engine, we wouldn't have so many of the things that we have today. They were people who took risks, and there will always be people who are naysayers. I grew up during the 60s, and trust me when I tell you there were many naysayers to Dr. King, but he instinctively went forward anyway. You cannot use public polls to determine personal purpose. Can intuition include knowing what is about to happen before it happens and, if so, what's the difference between that and maybe a prophetic experience? It in no way embraces clairvoyance at all; that's not what I was talking about. When I'm talking about instinct, to know what's going to happen before it happens, it's a completely different subject. What would you say the greatest gifts that God has given the African American community? I don't think that God gives gifts based on race or culture. I think that God deals with us individually irrespective of our color, and so I don't think that there are certain gifts that are inherent with African American people that aren't inherent in all people. When it comes to unlocking your destiny, this is not a group sport; this is an individual quest that we must take irrespective to gender and irrespective of our race.